The American aristocracy has always lived well off the theft of land and labor, but in the 21st Century, the game has changed. Dissatisfied with merely profiting handsomely from investing their inherited wealth in productive enterprise, the aristocracy today uses their publicly-funded privileges to gut American enterprise. Through hostile takeovers using private equity trading firms, they buy profitable corporations, sell off the assets, pocket the cash, and close them down. When that doesn’t work, they get bailouts from the U.S. Treasury. 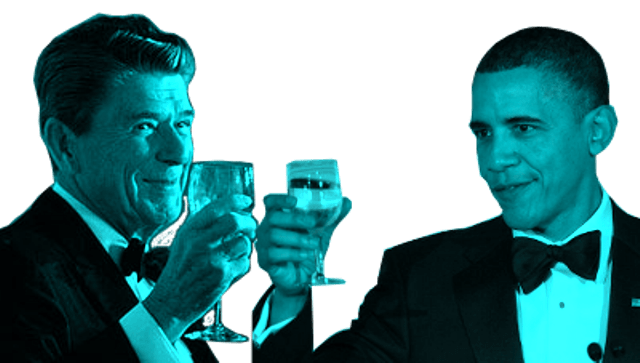 …it was Barack Obama who announced to us eight years ago that his ideological idol was Ronald Reagan, the epitome of American fascism.The growing numbers of unemployed, hungry and homeless in the United States is testimony to the success of the largely unregulated private equity trading in securing the aristocracy’s power and influence into the future. As owners of the media, as well as the financiers of most federal political candidates, the aristocracy pretty much rules unopposed. As for civil society NGOs and academic institutions, they have mostly succumbed to the aristocratic paternalism of philanthropic foundations, now functioning for the large part as public relations agents for privatization. 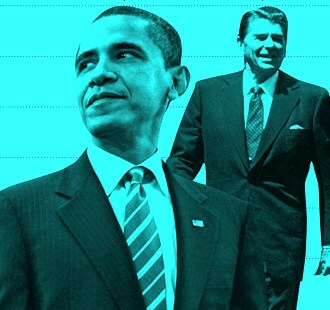 Some might want to lay all this at the feet of a genuine American aristocrat by the name of George W. Bush, but it was Barack Obama who announced to us eight years ago that his ideological idol was Ronald Reagan, the epitome of American fascism. Was no one listening?